Keeping Your Sour Dough Alive and Using It! 25 years ago my mother gave me a start of Sour Dough Starter. She got it from a friend the previous year who got hers from a friend and I am sure that it could have come from a longer line then that. I would love to know if the history went farther back than that, but at least I have a 27 year history behind my starter. I have heard of starters of 100 plus years old. One could start their own each time they make sourdough, but I think keeping the starter alive is somewhat of a rugged pioneer spirit. And, I think the flavor is fuller then a new batch. Sourdough is a fermented dough that was traditionally found in mining camps, chuck wagons and it was a staple for pioneers. In the pioneer days yeast was hard to come by and when it was available, it was almost always dead from the extreme conditions. Supplies were so precious and the use of an active Starter was always dependable. 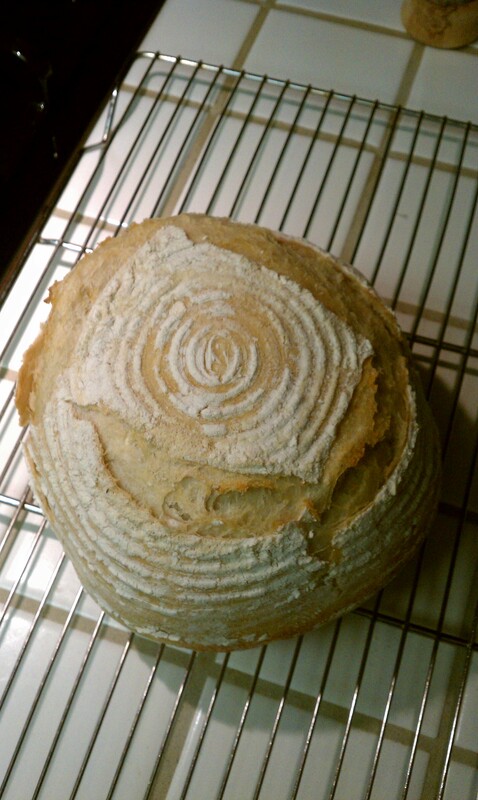 Sourdough has always intrigued me, even though it is such a simple, but yet rustic process. If you can’t obtain an heirloom or close to heirloom starter (mine has a few years to go), the next best thing is to make your own. Combine 2 cups cooled potato water (made from boiling potatoes with skins) 2 tablespoons sugar, 2 cups all-purpose flour (white or wheat). Beat by hand until you have a smooth, creamy batter. Keep this in a crock or bowl of at least 8 cup capacity so your starter will have room to grow. Active sourdough starter will have large bubbles and double in size. 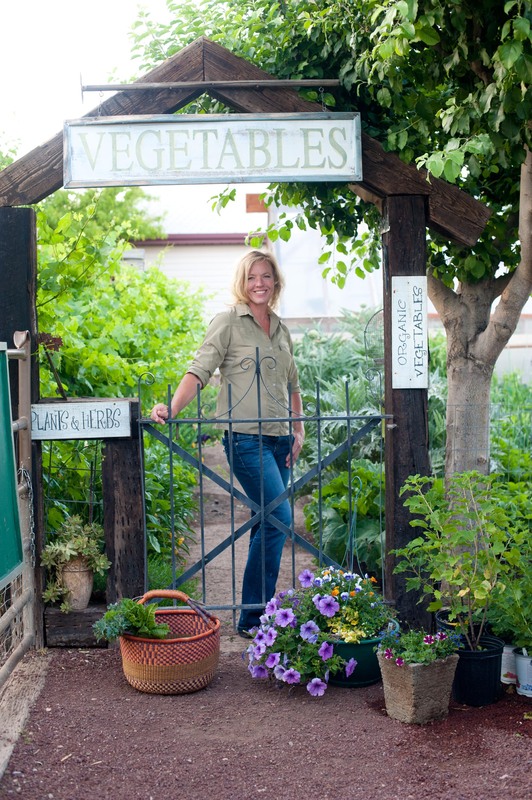 Cover with a clean cotton or linen cloth or a lose fitted lid. Make sure you don’t seal the container off airtight or you will be looking for an exciting explosion of dough all over your kitchen. Set your starter aside in a warm place for 3 days to begin fermentation. The starter can be used at this point as long as you have nice big bubbles, but it’s best to wait a few more days to have a more active starter and better “sourdough” flavor. At this point feed your starter with equal parts water and flour everyday to every other day depending on how often you use it. You will have to discard all but 1/4 cup of the starter each time you feed if you didn’t use it for making bread. I don’t always make sourdough bread, so I will feed it and put it in the frig for a couple of weeks and let it go dormant. Don’t let it go more than 3 weeks without feeding it or you could loose it’s vitality. When storing in the frig I always feed with white flour rather than wheat because wheat will go rancid faster. To feed it just pull it out, bring it to room temperature and then feed as above and you should be ready to make bread the next day. The night before you make your bread, feed the starter and cover with a towel. Overnight the wild yeasts will develop. 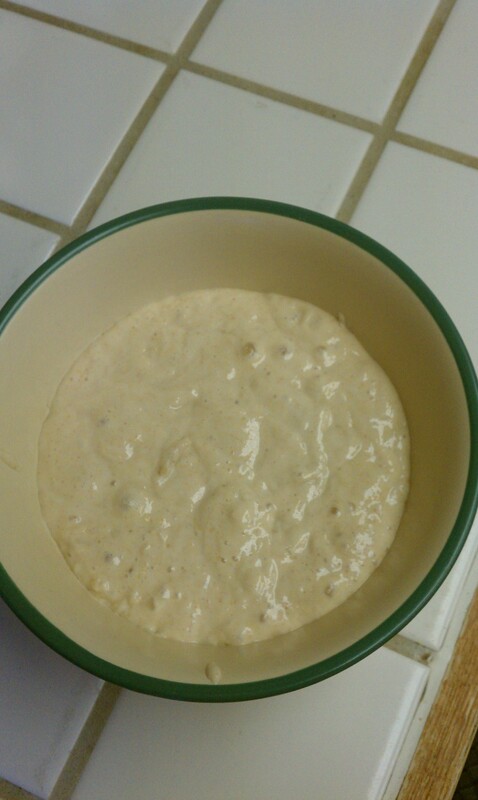 This will be your leaven. By morning your starter should smell sweet in an overripe fruit sort of way. You can always test your starter by dropping a spoonful of starter into a luke warm bowl of water. If it sinks, it’s not ready. If it floats, it’s ready. Basic Country Loaf: I like to start my bread in the early morning so I have enough time for resting and rising. In a large bowl add 700 grams (I like to weigh my bread dough ingredients) of luke warm water and 200 grams of leaven (starter). 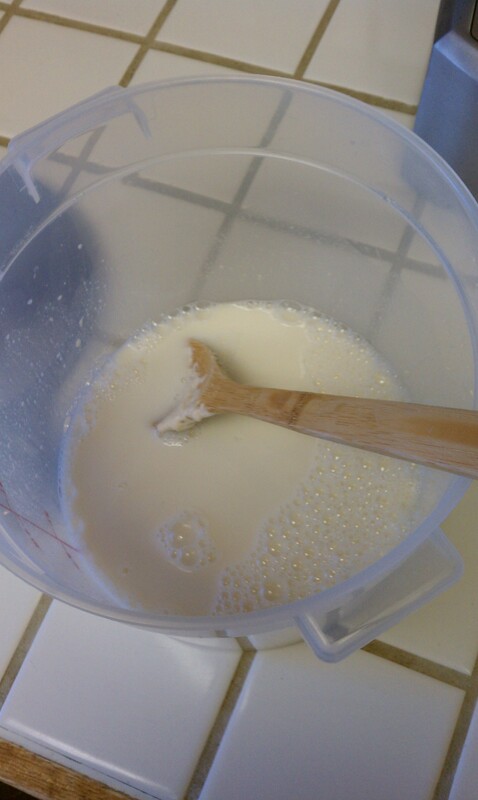 Mix to disperse the starter. Add 1,000 grams flour (80/20 white/wheat if desired). Mix Thoroughly by hand until you do not see any bits of dry flour. Let the dough rest 25 to 40 minutes. Don’t skip the resting period! After resting period, add 20 grams of salt and 50 grams of warm water to the dough. Incorporate the salt with your hands. Fold the dough on top of itself and place dough in a bowl for its first rise. Cover with a cloth and place in a warm room, 78 degrees for 3 to 4 hours. Dough will be rather sticky. Turn out on a floured work service and start to knead with a dough spatula. Use as little flour as possible. Divide the soft dough in half and start to shape by folding dough into the center and creating a smooth surface on top side. 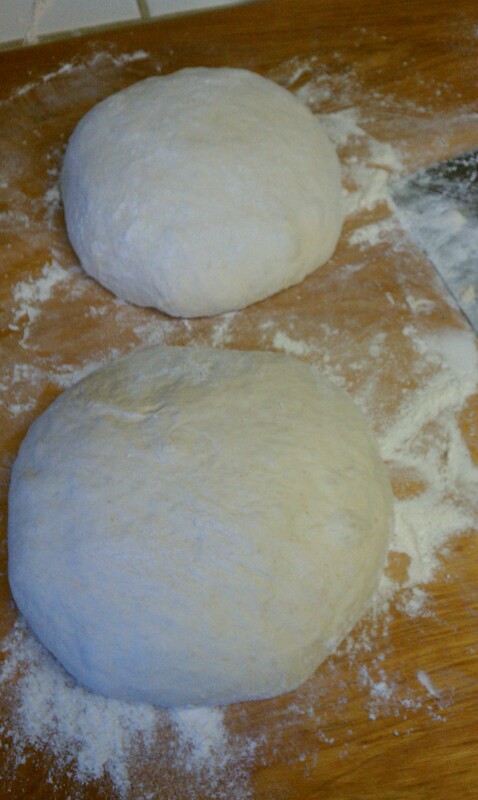 Place dough on a floured pizza/bread paddle or in a cast iron pan, folded side down and cover with a cloth. Let rise for 2 to 3 hours. Preheat oven to 450 degrees. If using a paddle and pizza stone make sure your stone is also preheated. Once dough has risen, slash tops with a very sharp knife or dough slicer. Slide into oven on stone or cover with a lid for the cast iron pan. Splash oven with water to create steam. I use a an old cast iron pan with lava rocks preheated and at the time of adding the bread I will quickly pour in 2 cups of water to create steam. You have to be very careful not to burn yourself when doing this, but it makes the best chewy crusts ever. Bake until the color of the crust is deeply carmelized, 20-30 minutes or longer if you want a strong crust. Nothing beats the smell of fresh bread! A couple tricks of the trade: Never use metal to stir, store or rise your dough. Metal causes a chemical reaction with sourdough. Don’t use tap water unless it filters out the chlorine. I feel that when using chlorinated water the sourdough never bubbles as well. If you feel like you can’t feed your starter for a long while you can dehydrate some of your starter on wax paper sheets, then powder it and store in an airtight container in the freezer for up to a year. I do this anyway just in case I lose my starter for some reason, I will always have a back up. I always use a kosher salt or sea salt.